• Offer shall mean cumulative purchases of Rs. 10000 or above using ICICI Bank Credit Card to get the Cashback as mentioned above. • Cashback shall mean Cashback of 3% on cumulative spends value of Rs. 10000 or more during the offer period. Maximum Cashback up to Rs. 1000 per card per customer. • Cashback shall be applicable only for those who have registered for the Offer and made at least 5 purchases amounting to a total of Rs. 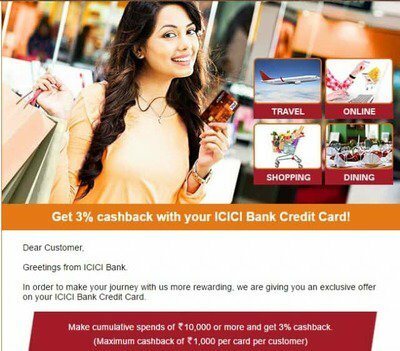 10000 or above using ICICI Bank Credit Card within Offer Period. • May 18th, 2017 to June 18th, 2017 (both days inclusive).